Stravinsky fans who know his original recordings will likely know the name of Adrienne Albert. She was famous to me for being the voice that sang Stravinsky’s last work “The Owl and the Pussycat” as well as many other of his late works. I found her voice refreshing, more popish and not so much of the wobbly operatic voice that most professional singers aspire to. She confessed to the maestro upon her audition that she had never had voice lessons, and he emphatically urged her to never do so. I ran into Ms. Albert maybe 10 years ago and asked whether she was THE Adrienne Albert and she said yes. Although I know she has to be older than 50-something, she still has a marvelous little girl aura, and is a completely likable, warm and friendly human being. Adrienne is a composer these days. No, she hasn’t picked up where Igor left off, she has carved out her own path. 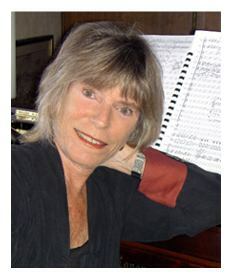 Last night, I heard her recently commissioned work “Between the dark and daylight” premiered by Mark Carlson’s award winning chamber ensemble Pacific Serenades. in three movements, the work is filled with modal Brownian motion that almost evokes an Americana tone. The last movement quotes a variety of children’s tunes and was, for this listener, the most engaging. The quotation techniques did not evoke Ives at all, but was rather completely her own. The emotional feel of it was kaleidoscopic and a bit like a musical roller coaster. It was peculiar that the most chromatic moment of the entire piece was her harmonization of “The Itsy Bitsy Spider” but the sold-out audience didn’t particularly mind, and offered her a resounding ovation at the end. Mark Carlson has to be thanked for being an important part of Los Angeles’s musical culture. No, it’s not the Monday Evening Concert series or the LA Phil’s Green Umbrella. It prides itself on presenting a new work every concert, (Adrienne’s was the 85th) right along side music from the common practice repertoire. ASCAP has already given Pacific Serenades an award for “Adventurous Programming.” Don’t expect to read about it in the LA Times or the LA Weekly as the series is regularly ignored by our local crickets. Like me, and other tonal composers, Pacific Serenades has developed a thick skin knowing it will likely be ignored by our Los Angeles tonality-only-on-my-terms music critics. David Ocker offers up his own brand of frustration on his blog about the history of many other ignored composers in our city. Adrienne seems to harbor no resentment as David, Mark, and I do from time to time. Her personality is as sunny as her music. I hope you get a chance to hear some of her music sometime, as she is a talent and a great gal as well. Thank you, Roger, for your thoughtful comments about me and my music. As you well know, it is such a thrill to hear our work come to life through the great musicians that Mark Carlson always brings together for his wonderful concert series, Pacific Serenades. And although PS is NOT MEC or the Green Umbrellas, it IS a series to be studied and copied by other chamber music organizations across the country. How many organizations commission a new work for EVERY concert grouping, bringing new works in along side the repertoire of those dead guys. And how many offer three concerts in a row in three different venues so that the musicians who have rehearsed (sometimes toiled over) the works have a real opportunity to grow with the music. Bravo Mark and Bravo Pacific Serenades. Aren’t we lucky to live in Los Angeles at this time with all the opportunities to hear all kinds of music in all kinds of places. I am writing this while looking out at glaciers across the Katchemak Bay in the Kenai Peninsula south of Anchorage, Alaska. A bit different from sunny SoCal, but a wonderful kind of different. And speaking of new venues, This little town of Homer, AK can pride itself on stretching its musical muscles! The Kenai Peninsula Orchestra and choirs are performing two concerts this weekend that includes a premiere of my “Alaskan Symphony” (commissioned through the NEA and ACF) for choir and orchestra, the Schubert Mass, AND the Beethoven Triple Concerto! How about that for adventurous programming! And this is the town that houses Tom Bodett! Adrienne, congratulations again on your premiere, which as I told you already I thoroughly enjoyed. I as well had those Stravinsky works on LP with The Owl and the Pussycat (it’s hiding now or lost, but I replaced at least that cut by getting a CD compilation just recently). I’m looking forward to the concert May 24th in Schoenberg with your new piece for saxophone, flute, and piano.